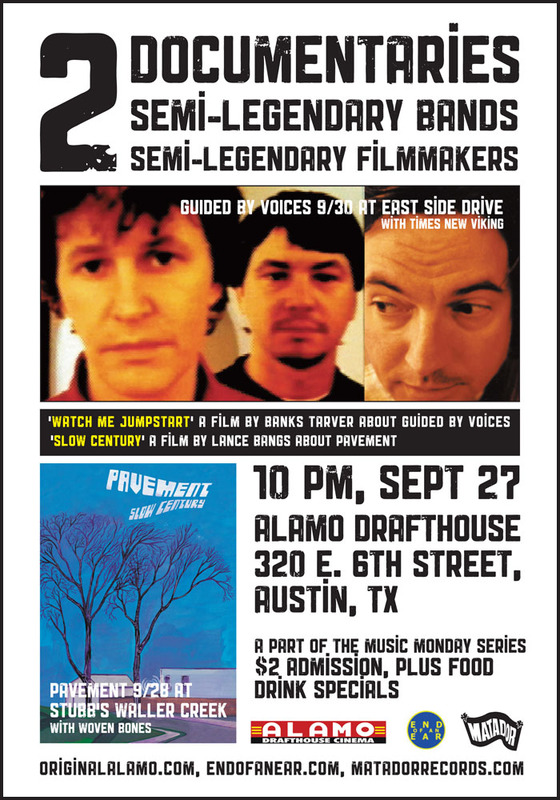 2 of the first documentaries ever made about music* are set to grace Austin’s silver screen later this month when Alamo Drafthouse teams up with End Of An Ear and Matador to bring you Watch Me Jumpstart and Slow Century — two films about esteemed Matador alums Guided By Voices and Pavement — as part of the Alamo’s Music Monday Series. $2 gets you admission along with some killer food and drink specials. And be sure to catch the bands when they come to the Casual Victi…. er…. Live Music Capital. the palms has movie theaters, too. theaters or theatres? regardless, you get where i’m going with this. it’s a cool idea Steve, but the Palms’ movie theatres will be showing their usual first-run Hollywood fare that weekend. We thought about a film series but time is pretty tight with the number of bands we’ve lined up per day. And there’s other stuff to do in the resort / city. Or so I’m told!